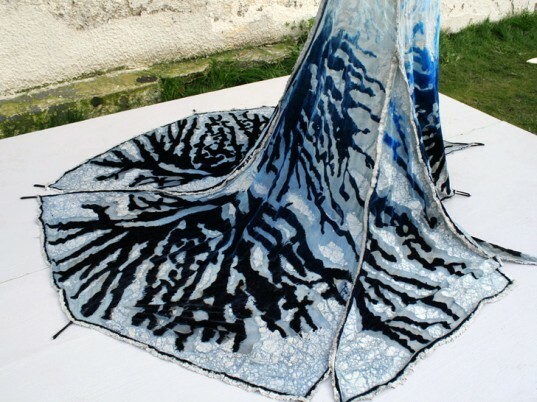 Although Herself is being presented as art, the science behind it could produce garments that improve respiratory health. An animated short about Catalytic Clothing does, however, paint a rudimentary picture of the project’s potential as crowdsourced environmental remediation. So although Herself is being presented as art, the science behind it could conceivably produce garments that improve respiratory health. The video depicts one possible scenario: 40 “Cat” people, standing across a meter of pavement, with the power to purify two meters of airspace in a minute. Fashion that betters lives? Now that’s something worth giving a frock about. Thank you for this post. Simply stunning dress eco-friendly or not. Amazing work. We have dresses to impress, for success, even to kill, but "Herself" must be the first drapey number to clear the air. 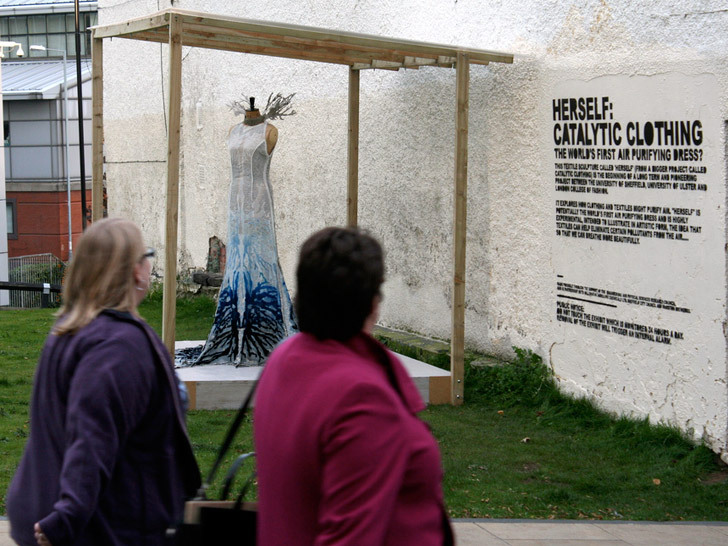 A collaboration between the University of Sheffield, London College of Fashion, and the University of Ulster, the sweeping gown is part of a larger project to engage the public in the science of environmental pollution. "Catalytic Clothing" explores how textiles can improve ambient quality, and the self-described textile sculpture, likely the world's first air-purifying dress, is the first prototype to emerge. Highly experimental, according to the designers, Herself is designed to illustrate how fabrics can eliminate pollutants so we can "breathe more beautifully."